I participated in my first competitive obstacle course a week ago. I have been wanting to do one of these things for 3 years and finally found some folks interested in doing it with me! We chose what is called a Battlefrog. It’s an 8K course with 25 obstacles designed and built by Navy Seals. It was a serious challenge. And we learned a lot as we made our way through hurdling ourselves over walls, climbing over monkey bars and massive structures rising high in the air and of course trouncing through mud carrying a 25-45 pound water jug. 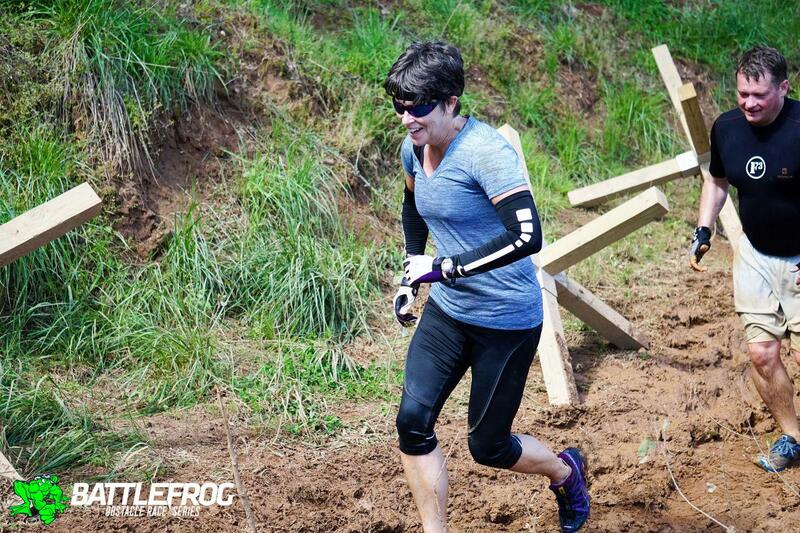 Here’s a few Battlefrog lessons. Lesson 1 – Scout out the obstacle – when you approach a new obstacle that you have never done before, take a moment and look on the other side of the wall. When you climb up the wall and are climbing over the top, when you don’t know what’s on the other side you can get yourself in trouble quickly. 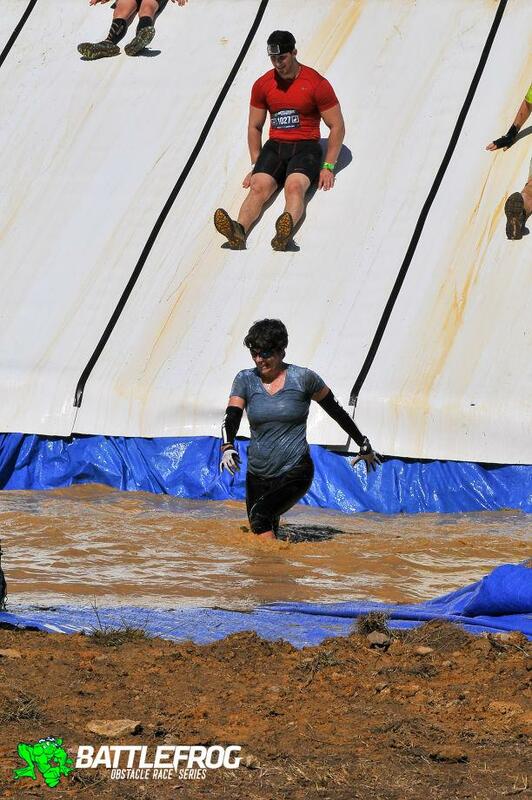 Sometimes the walls had a platform on the other side with a slide down into muddy water. Other times it was a straight drop to the ground. One time it was a 20 foot rope climb up to the top of the wall and then a rope climb down the other side with no platform to transition. Look at the obstacle from several angles and strategize so that you know what you are getting into and choose the right strategy for completing it. Lesson 2– Tackle the obstacle course with a team! When you are facing a challenge that you can’t do by yourself, figure out how to help each other through it. We were not very good at this because it was new to all of us. There were 4 obstacles out of 25 that I failed and the penalty was doing 10 burpees each time. I failed all of the ones that involved being able to do a pull up or cross monkey bars. I just didn’t have the upper body strength this time. It wasn’t until I failed the fourth obstacle for the same reason that it occurred to me to get one of my teammates to assist me through the monkey bars by asking them to use their hands to assist me. We’ll do better next time and stop and help each other out. I’ll do a better job of asking for help. Lesson 3 – Train, train train! Preparation makes all the difference in creating a positive experience. All of the training and all of the miles ran and all of the time spent rolling out sore muscles helped make the experience a blast. Doing the hard preparation work directly affects how successful you will be on the field. And part of the fun is having a goal and working towards it. Lesson 4– Just try it! You look at some of the obstacles and think “I can’t do that”. Maybe you can. Maybe you can’t. But testing your limits is part of the fun of this challenge. Each obstacle had varying levels of difficulty so you could adjust to your capability. Next time, I’ll choose a few intermediate levels now that I understand how they work. And I will have trained better and maybe I’ll succeed on some of those challenges that got the best of me. What’s the next challenge in your life? What’s the next opportunity you have to push yourself to the limit and see what you are capable of doing? It may be a mental or creative challenge and not physical. But don’t just cruise through life. Every once in a while you need to test your limits. God has created you in some amazing ways and given you this great big life to live- I bet you don’t even know all that you are capable of doing and being. Great but at the same time humble advice.